If the Farmers’ Almanac is any predictor of the 2016 winter outlook in Maine, residents can expect an average temperature of 19 degrees, weekly snow and ice, and intermittent periods of rain. With these estimates, drivers from Caribou to Augusta may be in for slippery and treacherous conditions from now until April – creating a perfect storm for potential vehicle accidents and injuries. Accidents can happen anywhere, anytime – Even on a seemingly innocuous winter day, hidden ice pockets can form in potholes, divets, and alongside the roadway shoulder. As well, “black ice” is a common issue plaguing Maine drivers at nighttime, causing high numbers of accidents due to unforeseen or unnoticed icy conditions. While traveling, keep in mind that – if the temperature is below freezing – ice and snow will persist, so always take proper precautions. Avoid distraction – Winter weather liability is about more than ice and snow, and driver attentiveness is a preeminent concern since the advent of web-enabled smartphones. While traveling Maine’s roadways this winter, avoid the temptation to check email, answer a text, or talk on the phone at all. In the event of an accident, one of the first factors police and plaintiffs consider is whether the other driver was texting or surfing the web at the time of the collision – which could create a significant issue for the driver later. Travel at appropriate speeds – It goes without saying that drivers should slow down during snow and ice storms. However, it is often recommended that drivers travel under the posted speed limits during particularly inclement weather. If snow, sleet or freezing rain are falling, take heed and reduce your speed accordingly – a step that could make all the difference in avoiding a perilous accident. When in doubt, don’t go out – Horror stories abound concerning the plight of drivers who attempted to travel in severe blizzards and “white out” storms. During the most severe storms, drivers can get lost even while traveling down the most familiar backroads and highways. When this happens, it is exceedingly difficult for responders to locate the vehicle or – even worse – for the driver to find his or her way to help. In most cases, the reason for traveling can wait. Be reasonable – Under the laws of negligence, a driver may face liability for engaging in unreasonably dangerous behavior while behind the wheel. 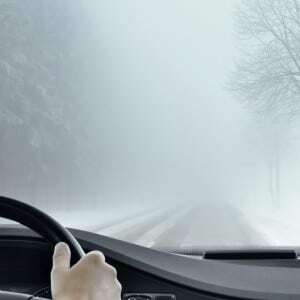 In winter months, this could include following too closely, speeding, or failing to adjust driving patterns for the inclement weather. During a car accident lawsuit, a plaintiff must prove that the defendant failed to follow reasonable standards of safety and caution given the circumstances at the time of the crash – which could involve any of the above-listed factors. At Hardy, Wolf & Downing, we are experienced in personal injury and negligence – particularly pertaining to harsh winter weather. For help with your case, give us a call today: 1-800-INJURED.